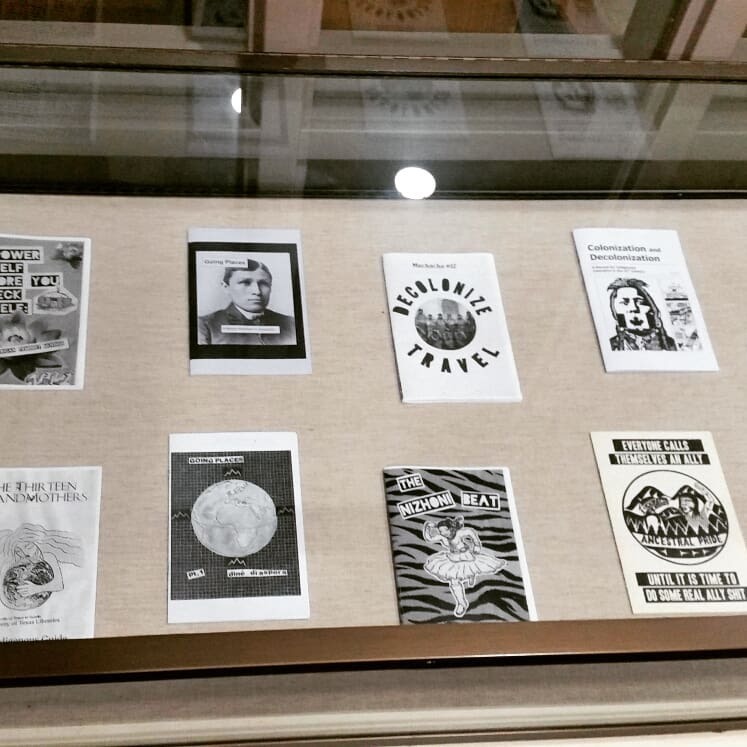 Taking its cue from Joy Harjo’s 2002 compilation of poems, How We Became Human, this selection of works from across the University of Texas at Austin’s library collections aims to highlight the continuity of cultural production by indigenous makers in the past thirty years. Harjo stated in the introduction to the text, “My poems from this era are of an awareness of being part of a continuum in which there is no separation of form or being; one people is related to another, this world is related to the next, that is: death is not the opposite of life. A story leads to a dream leads to a poem leads to a song and so on.” Her earnest desire to cultivate humanity in herself and others through writing is what has inspired this exhibition. The present-tense shift of Harjo’s title from became to become underlies the basis of this grouping- to highlight the artists, writers, and makers whose practices engage with the contemporary evolution of indigenous peoples. The imperative of this selection of fiction, non-fiction, poetry, scholarly publications, zines, comics, and film is to provide a context for understanding the rich cultural heritage of Native American communities and the complexities within. Each of the works chosen exemplify how their maker(s) navigates the world as indigenous, and the various ways that can be done. But more importantly, as Joy Harjo has shown, how they do so in an effort to become human, and to encourage us to do the same. This exhibition is curated by Kaila Schedeen, PhD Student in the Department of Art and Art History. She would like to acknowledge the location of these lands as historically sustaining the Tonkawa, Karankawa, and Lipan Apache peoples, and thank those ancestors who continue to live here or elsewhere. Thank you also to the Fine Arts Library for providing the space for this exhibition to occur during Native American Heritage Month.